The minimum viable product (MVP) is a product with enough features to satisfy the initial customers, and provide feedback for future development. Some experts suggest that in B2B, an MVP also means saleable. “It is not an MVP until it sells. Viable means that you can sell it”. The minimum viable product (MVP) is the one that allows us to launch the product with the least amount of features possible so that we can learn and extract relevant information from this trial period and user interaction through a series of metrics and then act based on that data. The best (and most common) way to explain an MVP is using this famous image. Image by Henrik Kniberg. Example of MVP. Do you want to make a car? Perfect! Let’s begin the process. How? First a wheel, then another, then another, then the engine, etc…Is there a problem? It will take too long to create the car we want. Solution? First make a skate, then a bicycle, then a motorcycle and then we end up with the car. Is the process longer? Yes. Is it more viable? Yes of course! I will not go into detail about the process of an MVP as there is enough information on this. We are here to comment on the death of the MVP, and the reasons that lead me to believe this. Are potential customers willing to lose quality (or at least the appearance of quality) just because this is a test? That is the point that I want to get to and I would like to explain; with the new times, new technologies and especially new generations, the internet is no longer a novelty, and e-commerce is no longer a novelty, a free chat application is no longer a novelty. Everything has changed. A few years ago, with the boom of the new technologies, a potential client was 30 years old, just had started to get internet at home, and the smartphones, it was almost unthinkable to have one if you weren’t an executive, but everything has changed. My neighbor of 12 years carries a smartphone with a capacity of x100,000 which is what NASA needed 40 years ago for the Apollo 11. The technological evolution is taking giant steps and consumers are also advancing and moving forward even if they do it at a slower pace. Yikes! When I was 14 years I didn't know or hear about Facebook, Instagram, Amazon or Whatsapp. None of them existed. Who in the world at any range between 18–40 years do not know about these services now? Few, if any. Users are accustomed to a minimum of quality, and they expect that of all new products. What does it mean? That all users expect a new social application to share the activity of that application (whatever it may be) with other social networks. Facebook, Twitter, Instagram, Whatsapp, etc… it’s that simple. If our product does not have such a simple feature, people will automatically believe that it is a bad quality product and they will not take it seriously. It is not what they expect. Hence my suggestion that the MVP has died and Map was born. In the present time, when you’re considering the development of a new product (whether physical, web, app, etc…) You don’t only ask yourself “This is the minimum that I need to make it viable?”, at first, it seems the right question, but the approach changes when we pose the following question. Is this the minimum of incredible product that I can create to be viable? The change of context is important. Before we only had in mind that the product being launched was functional enough. That the customer/user could do at least 2–3 basic things perfectly, but the client has grown, the client understands 5–6 basic things easily, we have to offer something more, something with which feels familiar and something that will surprise you at the same time. The best way to see this approach is with an example. Example of job search app design, both designs made in little more than 1h. Sorry, in Spanish. Header and Item of employment (which includes: name, date, company, type and remuneration). But it seems more reliable and attractive in MAP to the user/end customer. The target of this dummy application is a person (male or female) between 18–36 years, who knows the functions of the online job search, it is possible that they have used the Job type of applications and Talent, LinkedIn, JobToday, etc. Example of current job search apps. How do we intend to compete in 2017–2018 with a mediocre product when our competitors have apps with several years of advantage and with hundreds of thousands of customers already using them? Not only do we have to bear in mind that we have to compete with features (features), speed and fluidity, but also in the design of the product, because the user/end customer already has pre-designed in his head “how an application for employment should be”. And a better experience includes everything: features, speed, fluidity and design. This is essential to compete head-to-head against other apps. 6–8 years ago when there was no “standard” design or design patterns, everything was to be discovered. A simple graph of what was or was being sought with an MVP, which requires a MAP. A quick final example, in a new social network, do we really expect a product that does not have, for example, a search bar, a messaging system and a system of favorites or likes? No. We already have the pattern in our head about how things should look like in a social network. That is why at the time of launch for a new product, in addition to being quick, viable and economically speaking, affordable, we need to be as “awesome” as possible with the resources that we have. We need to make an effort to provide an experience that the user/client can find to be good enough to give you a chance. MAP depends a lot on how “awesome” the available alternatives are in your target industry. 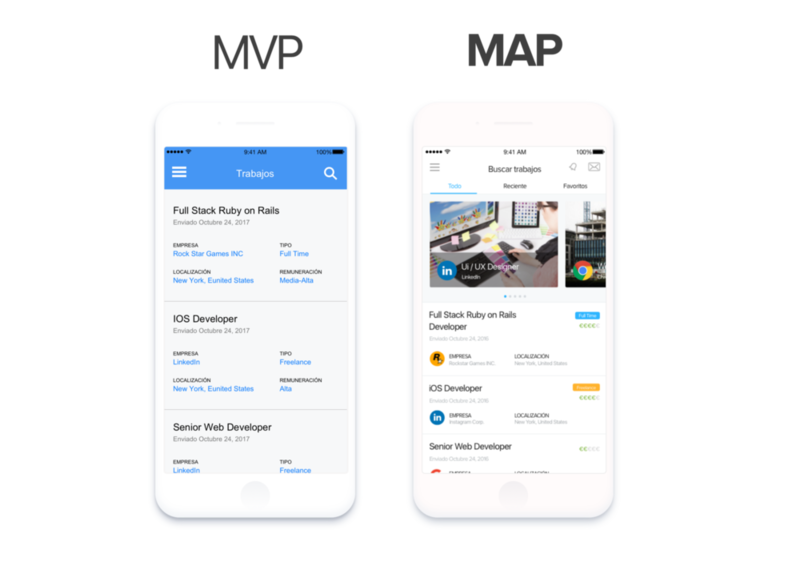 If zero alternatives, then MVP = MAP; if lots of options, then MAP > MVP. Thank you very much Dave for your comment, very correct. What would be an approach with this idea? Simple. So the next time you think about MVP, think about MAP, (unless you have no competition, then your MVP will automatically be a MAP, as there is no reference): fewer features, but all properly designed. Before creating any new feature in your product (MVP) think… do you really need this? If the answer is “Yes”, perfect, do it, but make sure that it works wonderfully (MAP). And many people will ask… Where can I find developers or designers to make a MAP? Wrong question! It’s not about developers or designers, it’s about the manager. You have to raise expectations, motivate and know that everything needs your time, you can’t do a MAP in a few weeks or a month. And you have to accept it! You need to manage and accept that everything needs your time and maturity. Better management is the solution for creating a good MAP. Disclaimer: Many people will say that the map is the same as the MVE (Minimum Viable Experience), I agree about 90%, but I am more in favor of the experience being merged with a good product, but it does not have to offer a good product design. For example, Craigslist, despite the fact that their service is extremely efficient, the product design very poor, so I prefer to search for products that are as awesome as possible. MAP.